Happy Saturday everyone and welcome back to Odds & Ends on the web! We made it back for a second week! "When Barry Fairweather dies unexpectedly in his early forties, the little town of Pagford is left in shock. Pagford is, seemingly, an English idyll, with a cobbled market square and an ancient abbey, but what lies behind the pretty facade is a town at war. Rich at war with poor, teenagers at war with their parents, wives at war with their husbands, teachers at war with their pupils...Pagford is not what it first seems. And the empty seat left by Barry on the parish council soon becomes the catalyst for the biggest war the town has yet seen. Who will triumph in an election fraught with passion, duplicity and unexpected revelations?" Oooookaayyy. We wish J.K. Rowling the best of luck with this new venture, which seems to be quite a bit different than her fantasy novels. It's getting quite a lot of hype (apparently thousands of people added it to their virtual shelves on the day it was released), but is that a good thing? Our friend Chachic over at Chachic's Book Nook wrote a great post about the hype that many debut authors receive and why she chooses to read mainly older titles. For the vast majority of debut authors who are not picked up by a major publishing house and hyped here, there, and everywhere - there's an interesting new(ish) way of getting your book published. The website Kickstarter, which is known for allowing every day citizens to donate toward nonprofit, entrepreneurial, and creative causes now has unpublished novels on it, just waiting for backers. Some of our favorite authors were among the nominees of The Hugo Awards - announced this week, including Mira Grant, China Miéville, and Catherynne M. Valente. 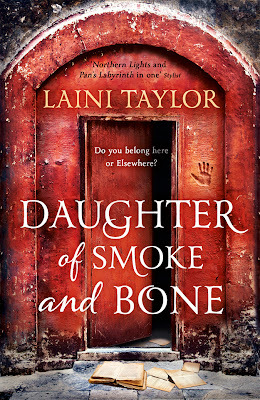 Also released this week is the cover for the U.S. paperback version of Daughter of Smoke and Bone by Laini Taylor. We are loving the creepy, frost-covered doorway. It's a nice change from the feathers and faces and seems much more relevant to the book. Ever wonder how starred reviews are given or why? And what they have to do with awards like the Printz? There was a great introduction to the topic on School Library Journal this week. The ALA released its list of the most challenged books for 2011 this week and The Hunger Games was #3! The book was challenged for, "Anti-ethnic; anti-family; insensitivity; offensive language; occult/satanic; violence." We're really struggling with "occult/satanic." Barbie got a little more badass this week, with a Katniss reboot. Perhaps sensing the coming apocalypse, google maps has handily provided the map of the dead - a tool for seeking out hospitals, food, and shelter during the zombie apocalypse. And lastly, here's a hilarious list of "rejected young adult series" to keep you all laughing as the world ends (much thanks to the brilliant Rachel Hartman for posting this list). *Correction: For Darkness Shows the Stars is in fact NOT Persuasion in space but is actually "post-apocalyptic Persuasion." We apologize! Thanks for linking to my discussion post! I added JK Rowling's latest title in my Goodreads wishlist but I have a feeling I'll wait for reviews to pop up in the blogosphere before I read that. Love the new cover for Daughter of Smoke and Bone, I agree that it looks better than the feathers and mask of the old cover. I hope they reveal the cover for the sequel soon! If not for JKR's name attached to this project, I belive much less people would be interested in it. The summary just doesn't sound that exciting. I feel that the new "Daughter of Smoke and Bone" cover reflects the mood and story much better. One of my favorite published authors, Kate Milford, is actually using Kickstarter to publish novellas that are sort of companion books to her traditionally published works, but not really of interest to her publisher. I LOVE the idea because we--the fans--get more from her than we otherwise would have, and it only happens if the fans actually have enough interest. Kickstarter is awesome. And, is it just me, or does the description for Rowling's new book sound a little boring? I am not saying that the idea or concept is boring, only that the description doesn't do much to create interest for me. Kickstarter is a new concept to me. I've always thought that if a writer has a work that his/her publisher not interested in, she/he can always self-publish. With Kickstarter you sort of have to pay for the pleasure of future reading in advance. It certainly requires much more fan dedication. But there are more perks that come with participating in something like Kickstarter as well. No, you are not alone. This book doesn't sound that exciting. I actually WAS living under a rock this past week and I still heard about The Casual Vacancy, so that's no excuse. I'm very curious about the book, but not at all optimistic. Oh, and this cover of Daughter of Smoke and Bone is my favorite so far. Just like last week, I'll be back tomorrow morning with coffee and check out all the links. Maja - I'm actually worried that all of this hype will do a great disservice to her novel. Judging from the blurb alone (which, granted, is very scant) this novel seems to be written for a completely different audience than the Harry Potter books. My guess is that there will be a lot of disappointment come September. I think I love that cover too! (I did like the feathers.) The doors have so much more to do with the story. That part with the feather mask is only a small scene. I'm glad you're enjoying these! Tatiana had a great idea here. Really enjoying this feature! I laughed at so many of the rejected YA novels, especially Dystopiary and The Sinister Door! I know of a few sports bloggers who've used Kickstarter to fund a new venture, but I was still surprised to see that MK Hobson was the author in question using it. I assumed it would be an author who had never been published before. More power to her though. I'm really excited for The Casual Vacancy. It reminds me of the Mapp and Lucia books I used to read. Nicholas Sparks.... WHYYYYYYYYY?!?!?! I try not to judge people on what they read, but what they watch is fair game, right? JUDGING SO HARD. Same here, Maggie. Hobson is an accomplished, award winning author, why not self-publish instead? As for Sparks, isn't there a channel already dedicated to his type of material, called Lifetime?